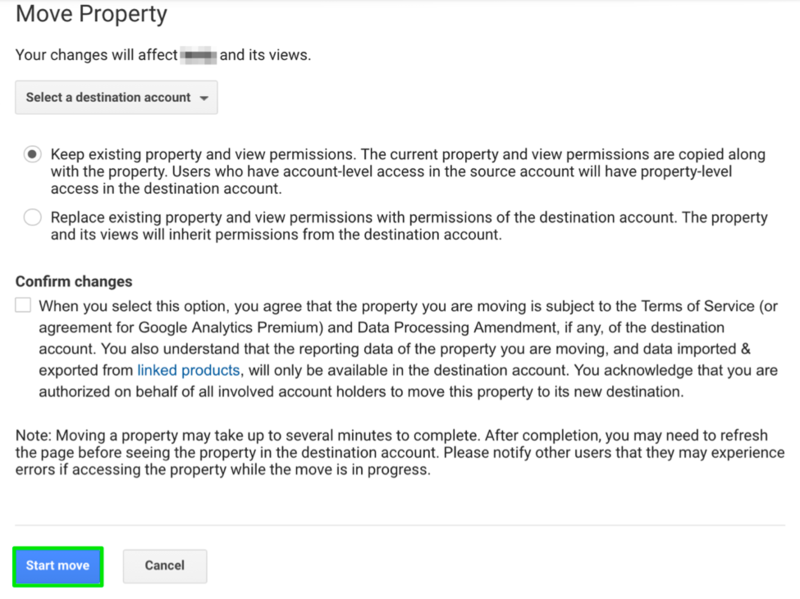 There have been rumors, whispers and lots of begging polite requests for one of Google Analytics’ most anticipated features – Property Moving. Prior to this update, planning a Google Analytics account structure was a big deal. Once you chose how many accounts to create and whether each website, business or department should have their own, it was impossible to change. The only way to get all of your properties into the same account was to choose which account to use and make completely new properties for the others. Ideally, each business or organization should have a single account. This one account could then have multiple properties representing each website or websites that the organization manages. Always, always ask to have your own account if you are working with an agency or third-party to set-up Google Analytics. We have seen situations where an agency has one account with separate properties for each client’s site. This is awful because it means that you will never have complete access to your account configuration and account management (for example, to create filters). Even if you haven’t created the website or implemented the analytics yourself, it is your data and you should have 100% permissions and control. For this situation, the owner of the account would be rightfully hesitant or unable to give you account-level permissions since you would then have access to all of the owner’s other sites. Often we give the advice to filter out internal traffic or setting up basic filters, but our training attendees aren’t able to because of permissions issues- property moving is the solution. If this sounds familiar, you can ask right now to have the property moved to your own account. This one is much harder to avoid. Even if you plan and use the most sensible account structure, there may come a time when your company acquires a new site or a new business. This is common with news organizations, publishers and universities. In this case, the sites would be split into multiple, legacy accounts. One of the drawbacks here is that governance around user access and permissions becomes less manageable. Also, you cannot take full advantage of the 360 Roll-Up Property feature to aggregate all of your business’ data. The Property Moving feature is exactly what it sounds like- we now have the ability to move properties from one account to another without losing any historical data. This means that Google Analytics can keep up and reorganize as your company reorganizes and grows. 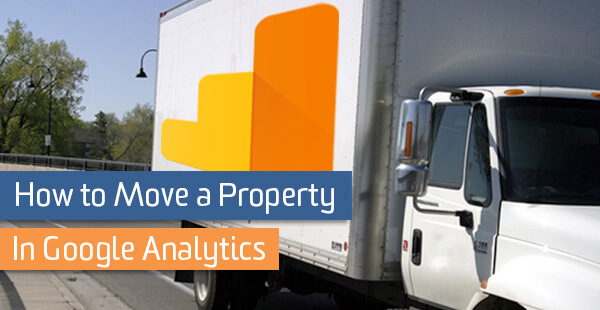 Property moving is available to both Google Analytics 360 and Standard (free) users. No matter how long your property has been collecting data or how much data you have, you will be able to use this feature. It is especially useful for publishers or large organizations using Google Analytics 360 with sites in several accounts. For the first time, it will now be possible to use the Roll-Up feature. Rolling up properties to view aggregated data is valuable but all properties must be in the same account. Remember that when you are moving a property, you are completely removing it from the account and not duplicating or copying it. Make sure everyone with access to the account is aware of the change and the implications. If only one property was in the account previously, the account can and may be empty once the property is moved out. You are also not starting from scratch when you move the property. The legacy data will move into the new account as well. In terms of account structure issues, this fixes the problem of properties being divided into separate accounts. However, this is not a solution for a website or websites that have been divided into multiple properties when they should be in one. For those types of questions or concerns, posts on cross-domain tracking and set-up should be helpful. Moving properties from one account to another is a simple process to the user- the complex work happens behind the scenes. First, you need to make sure that you have the highest permissions on both accounts: account-level “Manage Users” and “Edit” permissions. Then, after choosing which property to move, go to that property’s settings and find the “Move Property” button. If you cannot see this button, that is a sign that you do not have the necessary permissions. From there, you have the option to retain the same user permissions for the property (and the views within) or to overwrite the permissions with the users and permissions on the destination account. After confirming, you’re done! The move is quick and takes a few minutes at most so refreshing the Admin screen after a moment will likely reflect the move. There are situations where you can’t or shouldn’t move a property to a different account. For Google Analytics 360 users: When the property is outside of the 360 suite and you are trying to link to a property within the suite. For publishers: When you have already integrated DoubleClick for Publishers to your properties. I am hopeful that this will become another supported link for property moving. Right now it has to be unlinked, moved, and then must go through the process of re-linking with the request form, subsequent email contracts and Google enabling it for every property. For multi-site organizations: Roll-Up properties cannot be moved. It would be a better strategy to move properties into the account where the existing Roll-Up is. Does the property number (UA-) stay the same? Yes, the property will have the same ID even though it is in a new account. Will my views be deleted? No- moving the property moves all of the views within the property as well. They will still have the same filters, settings, dashboards, goals and annotations. Filters aren’t necessarily moved, they are copied to the new account. This is good because it means that if the filters are used in other properties’ views, the filter won’t disappear. If I am using a tool or reporting API with views in the property, will my reports break if the property is moved? No- since the view ID remains the same, all API reports and plugins should work just fine. Will this break my BigQuery integration? No- since the view ID remains be the same, BigQuery should also not be affected. Will I have to reconnect AdWords? No- property moving supports AdWords, AdSense and AdExchange linked accounts as well as DoubleClick Campaign Manager. Also, there should not be a gap in data since the move is so quick. Will I have to edit my Search Console settings or re-verify? No- this connection moves along with the property, so no additional action is needed. There are circumstances where property moving will make a significant change, such as using Roll-Ups or organizing several historic accounts into one. However, there are also situations where you should not or cannot move properties (for example with different 360 accounts or in cases where DFP is already linked to the properties). Even though there are a few limitations, the ability to move properties is an important and much-awaited update to Google Analytics. It shows that the platform is moving even more toward enterprise and large-scale web analytics.